In the AFC Championship on Sunday night; the Indianapolis Colts will head to Foxboro and take on the New England Patriots. This is a rematch of a November 16th affair in which the New England Patriots went to Lucas Oil Stadium and smoked the Indianapolis Colts. The New England Patriots are the top seed in the AFC. They were able to run away with the AFC East division, and came away with a big win last week over the Baltimore Ravens. New England went 12-4 in the regular season, despite losing in Week 17. For the Indianapolis Colts, after losing their first game of the season, they walked away with the AFC South division crown. Indianapolis had to win two playoff games; the first at home over the Cincinnati Bengals, and the second on the road at Denver. The Colts were 11-5 during the regular season. New England lost just one home game this season; the season finale to Buffalo. For Indianapolis, they recorded a 5-3 record away from home. The New England Patriots come into this game as nearly a touchdown favorite in Vegas over the Indianapolis Colts. The winner of this game will take next weekend off, before traveling to Arizona for the Super Bowl. The NFC representative will be either the Seattle Seahawks or the Green Bay Packers. The New England Patriots coasted in the final four games of the regular season. The Patriots ran away with the division by 3 games over Buffalo. The Patriots early in the season lost at Miami and Kansas City, and then in November fell at Green Bay. New England’s passing game anchored the offense. Former Michigan quarterback and Hall of Fame candidate in the future, Tom Brady was sensational again this season. Brady threw for 4,109 yards and 33 touchdowns on the season. A hodgepodge of characters served as Brady’s top targets on the season. Tight end Rob Gronkowski was the top target, but guys like Brandon LaFell and Julian Edelman had nice seasons as well. Gronkowski caught 82 passes for 1,100+ yards and 12 touchdowns. The running game for New England is a question mark. The opponents never know which running back to prepare from; as New England averaged 107 rushing yards per game. Defensively, the Patriots are set to put their top man Derrelle Revis on T.Y. Hilton, who is Indianapolis top deep threat weapon. New England scored 40+ three times during the season, and even reached 50 on one occasion. The Indianapolis Colts had success in 2014 despite not having a true top running back. Trent Richardson tried his luck, followed by Ahmad Bradshaw, with neither of them dominating the position. Then, Boom Herron took the job, and has been more successful than the rest. T.Y. Hilton is certainly the top deep threat for Indianapolis. Hilton caught 82 passes for over 1,300 yards and 7 touchdowns. Veteran receiver Reggie Wayne caught 64 passes; with 2 of them going for touchdowns. Former Stanford quarterback Andrew Luck has emerged as an elite quarterback in the NFL. Luck threw for more than 4,700 yards and 40 touchdowns on the season. The Colts defense allowed just 10 points per game in their final two wins of the regular season. Indianapolis ranked in the middle of the league in both rushing and passing yards allowed. Combined, the Colts allowed 342 yards per game. Indianapolis allowed 30+ points in all five of their losses this season. Well, many predicted this game would be played to decide the AFC Champion. New England and Indianapolis were favorites, along with Denver in July, and are still favorites in January. The New England Patriots appear to be healthy and ready to make the next step and get back to the Super Bowl again. For Indianapolis, they are still pretty young, but their quarterback Andrew Luck has been just exceptional. Can Andrew Luck go on the road and beat the Patriots on their home field? Can the Colts run the ball enough to keep New England’s defense off balance? Will the Colts defense be able to withstand the consistency that Tom Brady brings to the New England offense? Those are all questions that many are asking, and few are answering. Las Vegas is placing the Patriots as a touchdown favorite over the Colts. We do not think this game will get out of hand. We truly feel the Indianapolis Colts can hang in the game, as they will find holes in the New England defense. 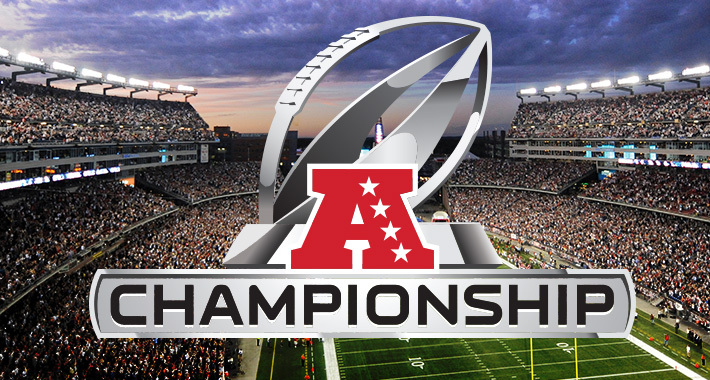 Our bet for the game is the Indianapolis Colts +7 over the New England Patriots in the AFC Championship game. We also feel like this game will go over the point total of 53.5. Our predicted final score is the New England Patriots 31-28 over the Indianapolis Colts.